According to to Remodeling Magazine’s 2015 Cost vs. Value report, composite decks carry an average return on investment of 77% in Ellicott City, Maryland. Ellicott City, Maryland is the crown jewel of Howard County. Since 2005, Ellicott City has been ranked four times among the top “20 Best Places to Live in the United States” by Money and CNNMoney.com. Ellicott City is the perfect combination of rural and urban, and its location between Baltimore and Washington, D.C. make it an ideal area in which to live. In fact, the median home value in the area is $474,000. According to to Remodeling Magazine’s 2015 Cost vs. Value report, composite decks carry an average return on investment (ROI) of 77% in Maryland. This means that a $15,777 deck will add $12,154 in value to your home. Not too shabby, huh? A composite deck is designed to last without much effort on your part. That’s why they are sometimes called low maintenance. Wood decks, meanwhile, require annual maintenance: cleaning, sanding, staining, and repeat. Composite deck materials are designed to stand up to the elements. Because of this, these decks are incredibly durable and can easily last 25 years or more. Composite decks are safe. They will not splinter, meaning no more “ouhies.” Most composite decks are also slip resistant. The right composite deck can make your home even more valuable, while providing you, your family, and guests with a place to relax and enjoy the great outdoors. WOLF Decking offers all the advantages of premium performance without the premium price. According to the company’s website, WOLF Decking offers “durable materials for every climate, budget, and design.” Formulated to closely resemble real wood decking, WOLF Decking gives you the natural look you love, combined with the strength of man-made materials. Freedom Fence and Home has provided the highest quality fence and decking services to the people of Maryland for more than 40 years. Please take a few moments to view our gallery. 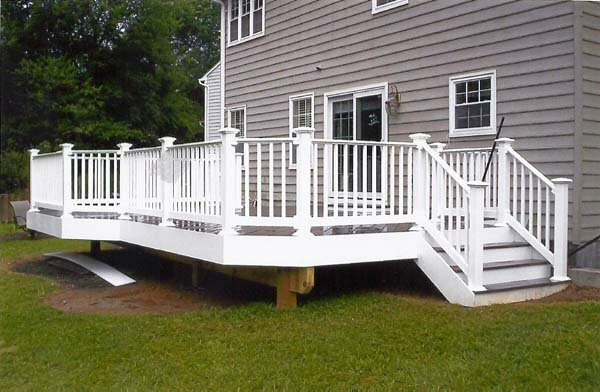 We proudly serve the Ellicott City area and our highly trained crews have successfully completed hundreds of composite decking projects throughout Maryland. As many of our customers can attest our quality and customer service exceeds our competitors. If you have any questions about WOLF Composite Decks, please contact Freedom Fence and Home by calling 443-271-6841 or visit our website. You can also follow us on Facebook and Twitter! This entry was posted on Monday, September 14th, 2015	at 6:21 pm	. Both comments and pings are currently closed.